Marshall Dlamini appears to have taken ownership of the incident after the 2019 Sona, which was filmed and went viral. 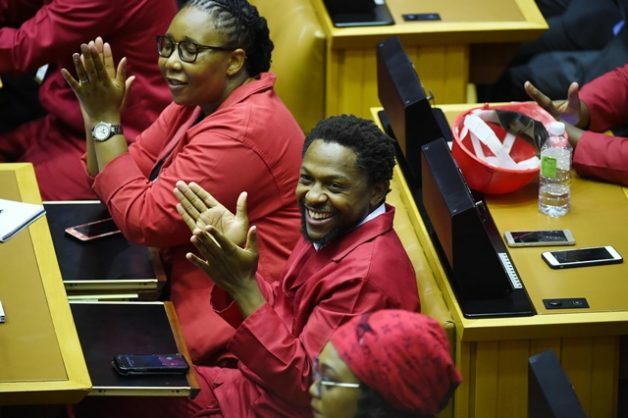 Marshall Dlamini, the EFF MP who slapped a plain-clothes police officer after Thursday night’s State of the Nation (Sona) address, has taken to Twitter, seemingly in defence of his actions. The Citizen reported initially that, while the person who slapped the officer is believed to be Dlamini, this had not been confirmed. It now seems Dlamini has taken ownership of having been the slapper, in a tweet that, while not referencing the incident directly, is almost certainly inspired by it. “I will never bow down, nor account to arrogant racists and white supremacy,” Dlamini tweeted. The EFF has claimed that the incident was an act of “necessary self-defence” as they had received information about a possible assassination attempt on their leader, Julius Malema, allegedly involving police in cahoots with right wingers.